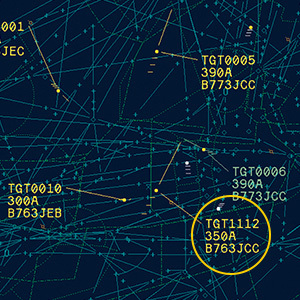 Predicts the aircraft movement 3-dimensionally, alerts air traffic controllers with predictive detection of potential mid-air collisions between aircraft, violations of prohibited airspace, and ground collisions in the airport vicinity. Tracking based on an aircraft's flight path in 3-dimensional space and flight plan information. Minimizes service interruptions with multiplexed system architecture, minimal failover time, and automatic restart capability. Maximum 4K×2K high-definition display with a high refresh rate and equipped with advanced an human-machine interface suited for radar air traffic control. This is a screenshot of a controller console in which aircraft information is displayed on a map that indicates flight paths and airspace information. The points include three lines of text information that indicate aircraft that are currently in flight. The green color indicates aircraft heading west, and the yellow color indicates aircraft heading east.